Draymond Green, Al Gore: Would-be Defensive Player of the Year says 2000 voting gives him solace. 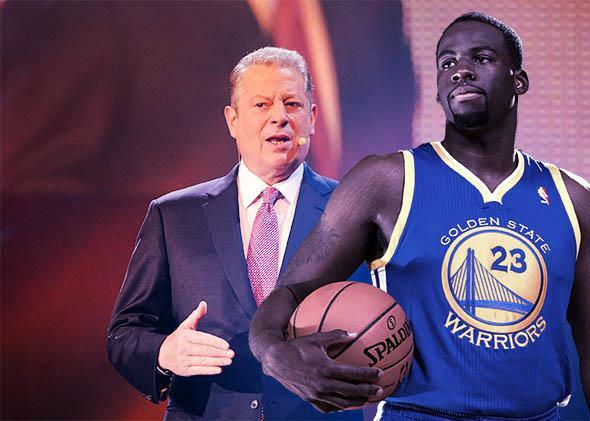 Al Gore and Draymond Green, kindred Americans. Draymond Green is a rising-star forward for the NBA’s Golden State Warriors who was considered a strong candidate to win this season’s Defensive Player of the Year award. In fact, the league announed Thursday that Green received more first-place votes for the award than any other player—but, because second- and third-place votes are also cast, Green actually lost the prize on overall points to the San Antonio Spurs’ Kawhi Leonard. Draymond: "Al Gore won the popular vote and didn't get elected president so I'm not gonna beat myself up over not winning DPOY"
That’s a particularly impressive civic analogy given that Green, who has a communications degree from Michigan State, was ten years old during the 2000 election controversy. Incidentally, it looks like Al Gore handily outpolled George W. Bush that year in Michigan’s 5th Congressional District, which includes Green’s hometown of Saginaw.